Rapide, the Moments of Truth company, commissioned a piece bringing together its work in the utilities sector and drawing the common ideas into a single theme. Here’s the PDF version (1.97Mb PDF). Most organisations look at their operations on a regular basis, seeking to cut costs or improve efficiency – it’s a normal part of performance management. But one sector that spans both private and public enterprise – the utilities sector – is different. Regulated by strict service agreements put in place by government policy, utilities have a legal obligation to deliver service above a certain level. 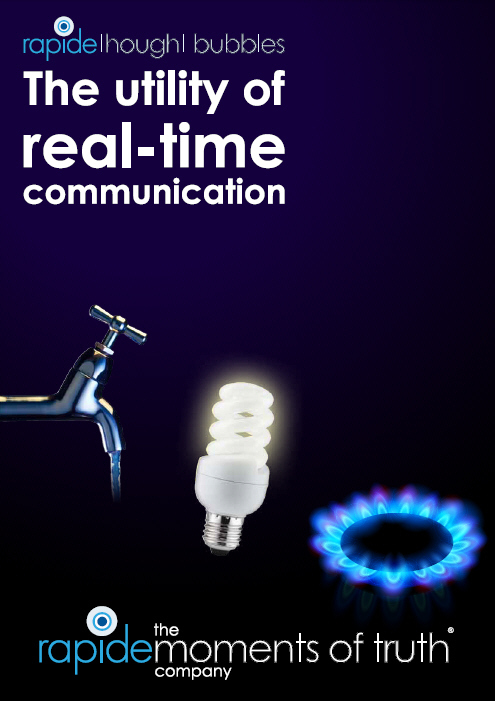 More and more utilities are realising they can’t deliver superior operational performance without the ability to manage it in real-time – conducting customer and employee communications at the point of service delivery, rather than with monthly reviews or survey questionnaires. A number of them use Rapide’s Communications Suite and Feedback Suite to do it. In this Thought Bubble, we’ll take a look at some of these companies – and how a typical regulator, Britain’s OFWAT, sets them standards to live up to.